Cat Dancer is the original interactive cat toy - an irresistible lure for cats and great fun for cat lovers. Cats are crazy about Cat Dancer because it simulates their favorite game: stalking, hunting and chasing prey. 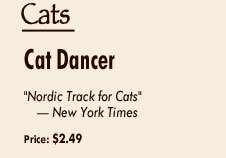 Cat Dancer can be used as a wand to play with your cat. Just lead and they will chase, leap and run in circles. Directions for games to play such as Spin-The-Cat, Cat-A-Pult and Cat Dance are included. We are pleased to say that the Cat Dancer’s package is made from recyclable cardboard and water-based inks. Cat Dancer is made from wire and cardboard, period - no artificially dyed feathers, mylar or plastics for kitty to chew on. And best of all, our cats go WILD for it!!! !